StoryBook Homes broke ground on its new subdivision, Boulder Hills Estates, Wednesday morning, reiterating its commitment to the community of Boulder City. Celia Shortt Goodyear/Boulder City Review Participating in the groundbreaking ceremony Wednesday morning for StoryBook Homes' new subdivision at the corner of Bristlecone Drive and Adams Boulevard were, from left, Mayor Rod Woodbury, StoryBook Homes Co-Principal Catherine Laska, StoryBook Homes Co-Principal Wayne Laska, City Manager Al Noyola, Councilman Warren Harhay and Councilwoman Peggy Leavitt. 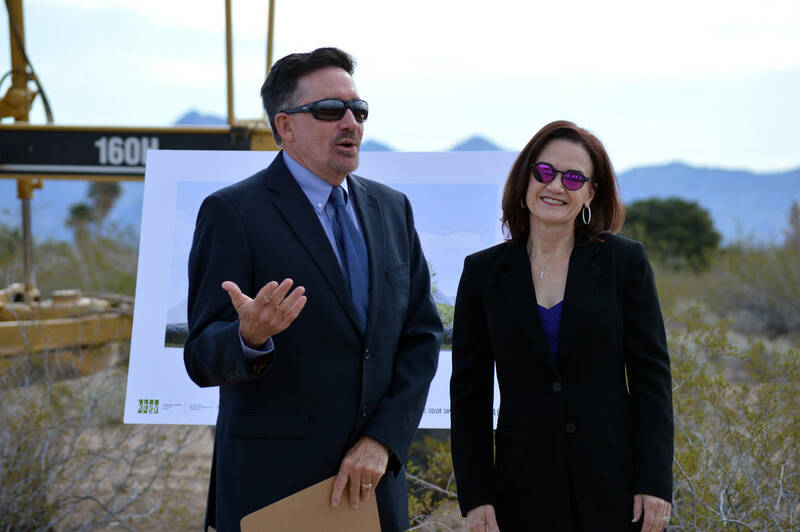 Celia Shortt Goodyear/Boulder City Review StoryBook Homes' Co-principals Wayne and Catherine Laska welcome those who came to the groundbreaking ceremony Wednesday for their 127-home new subdivision at the corner of Bristlecone Drive and Adams Boulevard in Boulder City. The single-family home development, to be built near the intersection of Bristlecone Drive and Adams Boulevard, will be the first new subdivision in the community in nearly 30 years. StoryBook started the process of purchasing the land and designing the subdivision more than a year ago. Laska said that when the project was experiencing some problems he talked to Mayor Rod Woodbury, who encouraged him to reach out to the neighbors in the area, and the project turned around. “We are not doing anything without meeting with the neighbors first,” he said. Laska said grading on the property should begin in about two weeks. 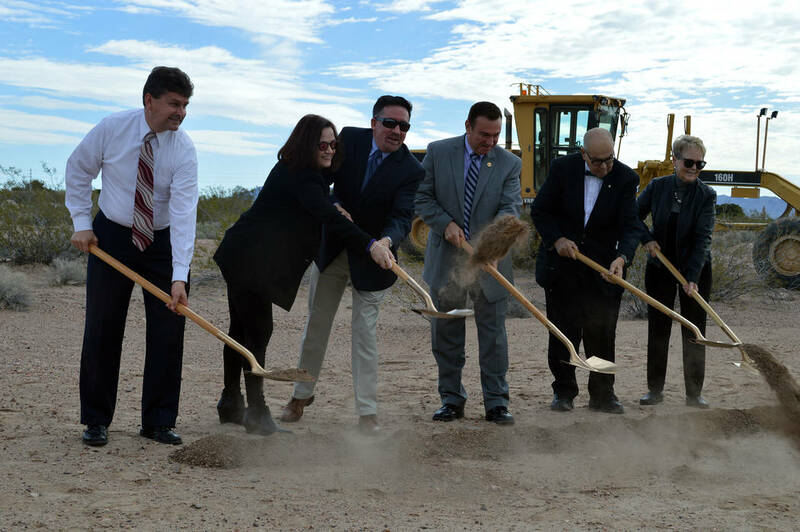 During the groundbreaking ceremony, StoryBook Homes donated $500 to each of the libraries at Mitchell and King elementary schools, Garrett Junior High School and Boulder City High School. Laska said they made the donations because StoryBook cares about the community and is big on books and reading because of its name. “I’m looking forward to see how the community responds,” said Catherine Laska, co-principal of StoryBook Homes, about the project. She said as a business they care about the community and are hoping residents realize they care equally about the town. Boulder Hills Estates will include 127 homes, including one and two-story units, offering three to seven bedrooms that are expected to be priced from the low $400,000s. According to Michael Mays, Boulder City’s community development director, the subdivision will add to the city’s existing tax base through the annual taxes as well as other fees required by the city. Each home will provide $1,000 for parks and recreation. Additionally, the builder contributes $900 for each home built to Clark County’s Regional Plan for transportation projects. The Las Vegas-based home builder is planning to purchase the 30.83-acre parcel in three phases for a total of about $9.1 million and build 127 homes. According to Boulder City officials, the last development approaching this size was approved in the late 1980s/early 1990s when work on the Municipal Golf Course Estates began. Coincidentally, Laska was a salesperson at Municipal Golf Course Estates, while he worked for Lewis Homes, the developer of the project. Models should be complete by the fall of 2018 with a grand opening scheduled for October or November.